Please send us a message and we will get back to you very soon. Thank you for your message. We will get back to you very soon. A lifestyle photographer and blogger based in Devon. This September I had the pleasure of visiting the stunning Lake Garda, a truly breathtaking and remarkable place! If you are thinking of booking a trip to Lake Garda, I would wholeheartedly recommend it. After hours and evenings of research on where to stay in Lake Garda, the decision was made. We chose to stay in Desenzano Del Garda. With a huge choice of restaurants and regular ferries to explore the lake, it was the perfect spot to call ‘home’ for our stay. Also, studying our route from Genoa Airport, this looked like the ideal location to minimise additional traveling on day one. Upon arrival to Desenzano Del Garda, we caught our first glimpse of the lake and were immediately wowed. After looking at all the pictures online, I was finally seeing it for myself! Crystal clear waters, dotted with white boats and in the distance the outline of the mountains. (Desenzano is at the bottom of the lake and is less mountainous.) The September sun was glorious and added extra sparkle to the lake. We spent the week enjoying high 20’s to low 30’s! We booked to stay at the Park Hotel. The Park Hotel has stunning views of the lake, is in an ideal location to explore and serves an amazing breakfast. Once we had checked in at our hotel and unpacked, we had a wander around Desenzano. We checked out the ferry times for the next day, and I enjoyed my first Aperol Spritz of many! Starting to feel peckish, we stumbled across what looked like a designer bakery and shared a slice of pizza and a vanilla custard filled doughnut! That evening we enjoyed a lovely bottle of white wine and a pizza in the square. That’s how you start a holiday! Sunday morning began with a delightful swim in the rooftop pool of our hotel, with the pool all to myself! The pool area was surrounded by views of the lake, mountains and typically Italian rooftops with washing hanging between the buildings! After the swim, we enjoyed our first breakfast at the hotel and as you do, we wanted to try it all! Plates filled, we found a nice spot on the terrace to sit and enjoy the delicious pastries, fresh bread, yogurts, granola, fruit… the list goes on! Once we had returned to our room to get ready for our day trip, we heard musical instruments coming from outside. I ran to the balcony to be amazed by a marching band, followed by a parade! Anybody that knows me, knows that I LOVE a marching band, so my morning was made! Bellies filled and ready for our day we set off to catch the ferry over to Sirmione. We paid €6 each for a return. (Private boats were also available to hire nearby. We intended to go back and do this but sadly ran out of time.) After a short boat trip, we arrived in a busy Sirmione. The place was full of Gelaterias, restaurants and lovely little shops. We walked over to the other side of Sirmione to start our walk around the top part of the point. In a matter of minutes, we had arrived at the other side and spotted a bar, which of course meant it was time for an Aperol Spritz. Enjoying our Aperol Spritz, looking at the lake, we heard a noise and noticed everyone started to look up. The Italian version of the red arrows was putting on a show right above us! 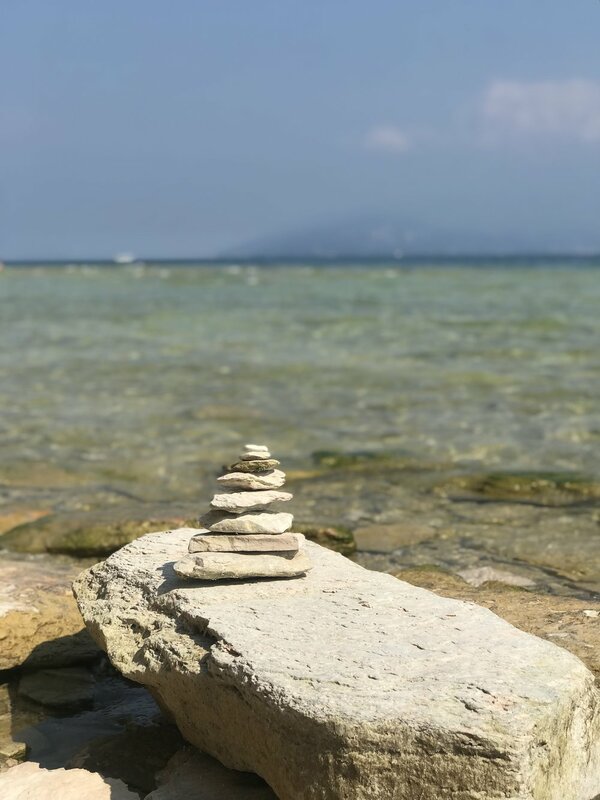 Our walk around the top of Sirmione consisted of remarkable hotels and jetties onto the lake, people bathing in the clay baths in the lake and a paddle along Jamaica beach! When we had reached Jamaica beach, we realised just how many people had come to see the air performance; it was like rush hour on the lake! 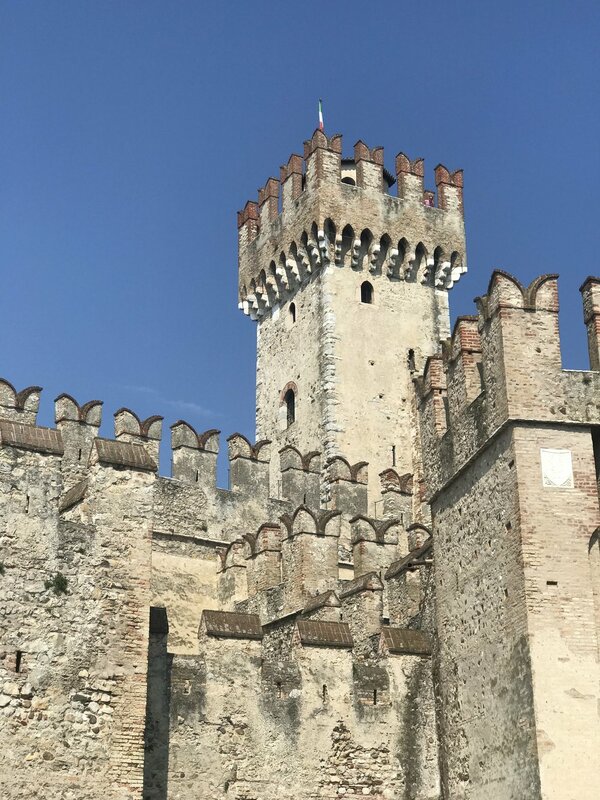 We spent some time exploring Sirmione and taking in the scenes of Scaligero castle, one of the most well kept and complete castles in Italy. Before returning to Desenzano on the ferry, we stopped off at one the many gelaterias for some gelato. One scoop is certainly all you need, the scoops are huge! Later that evening we had dinner on another delightful little side street. We enjoyed a bottle of wine and a bowl of pasta, before walking it off with a stroll along the lakeside. Monday came and it was the day I had been waiting for. We had planned to drive around the entire lake and stop off at various locations. After doing some research online, I was informed to drive around the lake without stopping would take three hours, so we set off clockwise around the lake mid-morning. We first stopped off at Salo, a gorgeous town with the longest promenade on the lake. 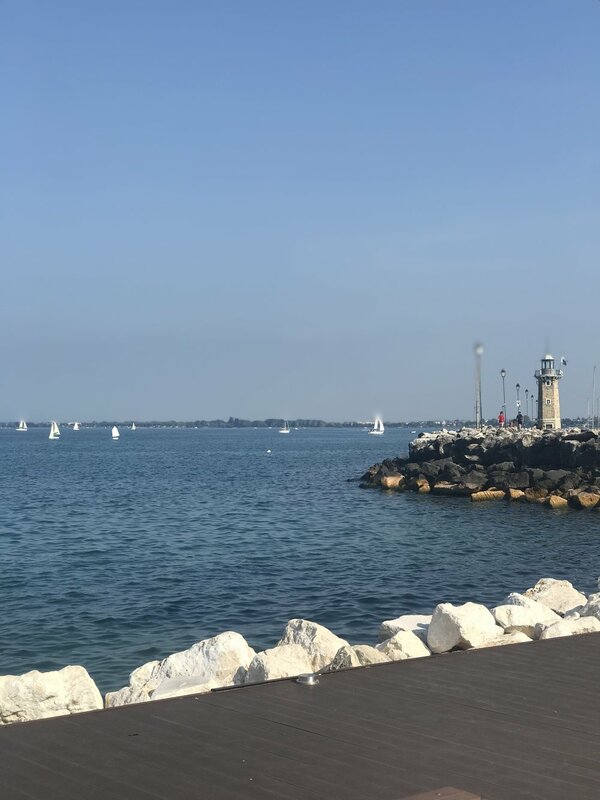 With an abundance of cafes and restaurants to sit and enjoy gorgeous views of the lake, stunning architecture and plenty of shops, it is somewhere I would recommend staying. We parked up in a car park on the front and took a short stroll along the promenade and through the cobbled streets. We then continued our journey to our next stop at the top of the lake. The next part of our journey consisted of a few tunnels. When I say a few tunnels, I mean ALOT. Long tunnels below and through the mountains, but surprisingly, right next to the waters edge (Or just above.) I was expecting to go up into the mountains on windy roads, right on the edge, but that was not the case. Although the tunnels were a bit daunting at times, through the little windows I could see glimpses of the lake and increasingly large mountain silhouettes, I began to get excited. We arrived at the very top of the lake around midday, at a place called Riva del Garda. We parked up the car and took a stroll to the beach. The scenery was breathtaking! Such clear waters, surrounded by huge, tall mountains, covered with a dusting of haze! It was so calm and I couldn’t help but just gaze at the amazing nature all around us. We then continued down the other side of the lake in search of a pleasant spot for lunch. We saw so many incredible cars being driven and lots of watersports on the lake. It really is a place that is enjoyed in so many ways, by so many people! After a short drive, we came across a lovely little lakeside restaurant called Ristorante L’antico Frantdio in Pai. We were sheltered by trees and had calm waters in front of us, with the mountains as a backdrop. It really was picturesque. I opted for a truffle and cheese stuffed pasta and a refreshing peach iced tea. The seafood dishes that were being brought out looked and smelt incredible! I really recommend this place if you are looking for al fresco dining with wonderful views and delicious Italian food! We then set off back to Desenzano Del Garda. We passed through some slightly more ‘populated’ areas of Lake Garda and then finally through the gorgeous Peschiera del Garda. Driving around the lake is something I would definitely do again. Having the freedom to park up and explore wherever we wanted, certainly created some incredible memories. On Tuesday we woke up to the market right outside the hotel, lining the streets. After breakfast, we took a stroll through the market and admired the local produce. A stroll through the market turned into a spontaneous walk up to the castle. We passed through some gorgeous little side streets and admired the amazing views from the castle walls. After boating across the lake and driving around the lake, we decided we wanted to go in for a swim. After returning from our castle walk, we packed up our things and took a short stroll to a small beach with some sun loungers that were available to hire. We lazed in the sun for a couple of hours and swam in the lake. Post swim we decided to grab some lunch in a restaurant on the beach. That evening we headed back to La Vite 2.0, a wine bar we had spotted on our walk up to the castle. Isn’t it always the way that you find your favourite places on the last evening! La Vite 2.0 was a fantastic wine bar with modern indoor seating, candlelit tables on the side street and a small courtyard out the back. There was an array of wines to choose from, and the waitress had an amazing knowledge of the wines. I opted for a local white wine called San Marino Bella Battaglia. I enjoyed this so much, the waitress suggested I try the rose equivalent, Rosa Di Giada. To go with the wine, we ordered a selection of bread and antipasti. We then shared a delicious chocolate dessert, followed by cocktails. This was my favourite evening at Lake Garda, and I would go back to La Vite 2.0 in a heartbeat! It was the perfect spot to just sit and enjoy fine wines, delicious food and watch the world go by! On Wednesday morning I had my final swim in the pool and breakfast at the hotel, before we packed up our things and set off to Cinque Terre. Visiting Lake Garda is a trip I have wanted to do for a long time and it really did exceed my expectations. The lake is absolutely beautiful and I really didn't want to leave. I will return Lago Di Garda.